NOTE: You use (DragonSlayerLevel*0.75 + VampireHunterLevel*0.25) to determine your Class Level. So if you have not trained Vampire Slayer, then you will not be able to access the higher-level skills! Also see DragonSlayer, Elite Dragon Slayer, and Golden Dragonslayer. This armor was commissioned by Galanoth for the more experienced and powerful members of his order. The steel has been alchemically treated to provide extra resistance to attacks! C is your current "Golden" Class Level. This is equal to (DragonSlayerLevel*0.75 + VampireHunterLevel*0.25), rounded normally. *Your Combat Defences increase by 0.6*C each, rounded normally. ***On Monster Category "Undead"/"Were" AND "Dragon", they decrease by (C*0.25 + 2.8)% each, rounded normally. ***On Monster Category "Dragon", they decrease by (C*0.1 + 2)% each, rounded normally. ***On Monster Category "Undead"/"Were" AND "Dragonkin"/"Drakel", they decrease by (C*0.125 + 1)% each, rounded normally. ***On Monster Category "Undead"/"Were"/Dragonkin"/"Drakel", they are unchanged. ***On anything else, they increase by (C*.125 + 1)% each, rounded normally. On Monster Category "Undead"/"Were" AND "Dragon", all Player Attacks, Spells, and Specials deal 125% Base, Random, and Stats damage. On Monster Category "Dragon", all Player Attacks, Spells, and Specials deal 115% Base, Random, and Stats damage. On Monster Category "Undead"/"Were" AND "Dragonkin"/"Drakel", all Player Attacks, Spells, and Specials deal 110% Base, Random, and Stats damage. On Monster Category "Undead"/"Were"/"Dragonkin"/"Drakel", all Player Attacks, Spells, and Specials deal 100% Base, Random, and Stats damage. On anything else, all Player Attacks, Spells, and Specials deal 90% Base, Random, and Stats damage. Those who wear the armor of the DragonSlayer and carry the title with pride are made of hardy stuff. You gain +(2*C) when making a Save Roll to resist the fear effects of Dragons. Your special training has taught you how to strike true and deep especially against Undead or Were Dragons! Each round the effort takes «» SP. This uses Round(Round(38.1 + 2.3375*E+ 0.01125*E^2)* 0.855) SP. If you cannot pay the cost, the attack is the usual Normal Attack. Against Monster Category "Undead"/"Were" AND "Dragon", this deals (90 + 70/3)% Base, Random, and Stats damage. Against Monster Category "Dragon", this deals (90+50/3)% Base, Random, and Stats damage. Against Monster Category "Undead"/"Were" AND "Dragonkin"/"Drakel", this deals (90+40/3)% Base, Random, and Stats damage. Against Monster Category "Undead"/"Were"/"Dragonkin"/"Drakel", this deals (90+20/3)% Base, Random, and Stats damage. Against anything else, this deals 95% Base, Random, and Stats damage. This replaces the Normal Attack for all intents and purposes, including when using other Skills that reference the Normal Attack. You channel the power of the dragons you have defeated to strike your foes with a blast of light dragon's breath! Against dragons it strikes the weakest element! Effect: Against Monster Category "Dragon", "Dragonkin", or "Drakel", it becomes Element Seeking. You have learnt to study your foes attacks in order to better defend against them. When the monster attacks, you gain +1 Combat Defence to the hit's type (Melee/Ranged/Magic), and you gain -1% Element Modifier to the hit's Element. This only applies for the first two hits that the monster does, and is applied regardless of whether or not the hit connects. Call a loyal light drayk to fight by your side! She must have megdragon blood as her breath can deal nonelemental damage to Dragons! Summons Draykwing as a Guest. Cast again to dismiss her. Coat your weapon with a homemade mix of holy water, wolfbane and dragonbane! It costs «» SP per round to keep the blade coated. While active, you pay additional SP whenever you perform a Normal Attack. If you cannot pay, the rest of the effect is not applied. The level of the poison is equal to E plus 25 (against Monster Category "Undead"/"Were" AND "Dragon"), or 15 (against Monster Category "Dragon"), or 10 (against Monster Category "Undead"/"Were" AND "Drakel"/"Dragonkin") or 0 (against Monster Category "Undead"/"Were"/"Dragonkin"/"Drakel), or -10 (against anything else). You know just where to strike a dracolich or weredragon for maximum effect, weakening it! This costs Round(Round(38.1 + 2.3375 *E + 0.01125*E^2)* 0.22265625) SP. You perform a Normal Attack. If the attack connects and deals non-zero damage, then the monster is Crippled. The level of the Cripple is equal to (7.5 + S) rounded down, multiplied by 1.25 (against Monster Category "Undead"/"Were" AND "Dragon") or 1.15 (against Monster Category "Dragon") 1.1 (against Monster Category "Were"/"Undead" AND "Dragonkin"/"Drakel") 1.0 (against Monster Category "Were"/"Undead"/"Dragonkin"/"Drakel") or 0.9 (against anything else). This effect can Cripple a monster a maximum of 4 times (against Monster Category "Dragon") or 3 times (against anything else). Other sources of Cripple count towards this limit. You can tap into the otherworldly power in an undead or lycanthropic dragon and reverse it to heal your own wounds! Otherwise, it costs Round(Round(38.1 + 2.3375*U + 0.01125*U^2)* 0.855) SP. You perform a Normal Attack, with Base, Random, and Stats damage multiplied by 120% (against Monster Category "Dragon") or 105% (against Monster Category "Dragonkin" or "Drakel") or 90% (against anything else). You then heal HP equal to (DamageInflicted*0.6), rounded normally. You have added some alchemically-treated dragonscale backing to your armor which greatly enhances your Slayer's Guard. The effect of Slayer's Guard is doubled, to +2 Combat Defence and -2% Element Modifier when hit. Attacking an undead or weredragons spirit when it draws close allows you deplete its mental reserves! You perform two Normal Attacks. The first does 120% Base, Random, and Stats damage and damages your opponent's MP. The second does 90% damage and damages your opponent's SP. Draw upon the power of Sora the Shadowbane to strike with the power of a Dragon's Heart! Otherwise, it costs Round[(Round(38.1 + 2.3375*E + 0.01125*E^2)* 0.285) + Round(38.1 + 2.3375*U + 0.01125*U^2)*0.57] SP. *Against Monster Category "Dragon", the Element is Light, Harm, or Void, to whichever the monster is weakest. Against anything else, the Element is Light or Harm, to whichever the monster is weakest. If the Element is Void, then the damage is doubled. **Stat Bonus to damage is CHA/8. Stats Bonus to BTH is CHA/8. Otherwise, you perform Dragonheart Strike. This is a four-hit attack. The first hit is a Normal Attack that deals (850/37)% Base, Random, and Stat damage, multiplied by 1.2 (against Monster Category "Dragon") or 1.05 (against Monster Category "Drakel" or "Dragonkin") or 0.9 (against anything else). You heal HP equal to 80% of the damage inflicted, rounded normally. The second hit is a Normal Attack that deals (1785/37)% Base, Random, and Stats damage. This damages the opponent's MP. The third hit is a Normal Attack that deals (1338.75/37)% Base, Random, and Stats damage. This damages the opponent's SP. The fourth hit deals (850/37)% Base, Random, and Stat damage, and Cripples the opponent as in Cripple Dracolich. Images from ssjgoku5 (skill tree) and Dil (armour). Update from Kalanyr (via algimantas2, Ash the Phantom, and Sora Aeragorn), Valane, Kralc, sunchang, jimij770, Lucario0708, and yorisan. Correction from wartan. Typo correction thanks to Dwelling Dragonlord. MajSave is the bonus to the save, which is then compared to the monster's END. For Dragonheart Strike, assume (Unscaled) Class Level 10. Otherwise, you can't cast it. 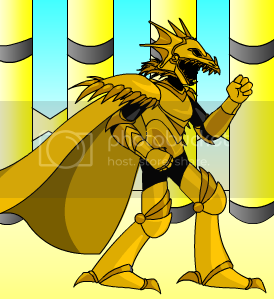 A special golden armor of DragonSlayers, with a double attack! Purchase this armor only if you want to go on the Dragonslayer class quest or already have. 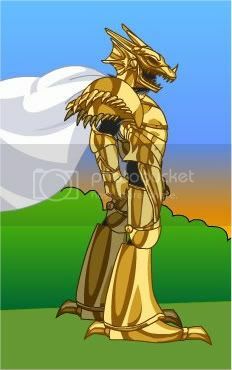 A special golden armor of DragonSlayers, with a double attack! The Eclipse version of the armor hides your face in darkness, and provides slightly better Melee defense. Element: Your weapons element then Light. Unleash the magical fire breath of Dragons from your fingertips. It is capable of doing from 5 damage up to your level +9 damage. On dragons it does from 10 damage up to 18 + 1.5 x your level in Element X damage! Use your blade to deliver a magically chilling stike to your opponent, it will freeze dragons who do not like the cold! Freezes Dragon, Drakel, Lizard, or Velociraiders. Engulf your Dragon foe in a cloud of poison that lasts 12 rounds dealing 5% life per turn. Uses guest spot. Strike your dragon-kind opponent for 150% damage with +25 BtH and steal 50% of the damage you dealt to increase your health! Does 110% damage with a +4 BtH to non-dragons. You gain 50% of the damage you do with this attack as hp. Summon the loyal Draykwing to fight by your side. Cast the spell again to release him. His firey breath becomes Element X versus Dragons and does extra damage depending on you level. Call forth a massive Fire Dragon to unleash fiery terror upon thy opponent. 90 * (Level/10) Fire Damage. Does 90 * (Level/5) Element X damage to Dragons! Note: The cape can be removed by clicking on it. Thanks to Wingman, Tainted_Flesh, ReshyBaba, Fabled Requiem, smooth criminal and JaredHawthorne. New location from Baruman. Image from feral__john. Skill tree from Teuvi and Sora Aeragorn. New description from Irios.